role in a social learning environment. " Mental Imagery based Brain-Computer Interfaces (MI-BCI) enable their users to control an interface, e.g., a prosthesis, by performing mental imagery tasks only, such as imagining a right arm movement while their brain activity is measured and processed by the system. 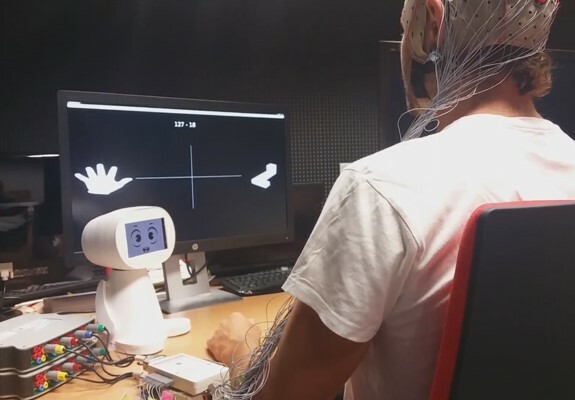 Designing and using a BCI requires users to learn how to produce different and stable patterns of brain activity for each of the mental imagery tasks. However, current training protocols do not enable every user to acquire the skills required to use BCIs. These training protocols are most likely one of the main reasons why BCIs remain not reliable enough for wider applications outside research laboratories. Learning companions have been shown to improve training in different disciplines, but they have barely been explored for BCIs so far. Our first experiment using a learning companion to provide emotional and social support during BCI training showed promising results (see picture). Indeed, the learning companion was able to improve part of the user-experience, i.e., how people felt about their ability to learn and memorize how to use an MI-BCI. Also, non-autonomous people, i.e., who are more inclined to work in a group, that are usually disadvantaged when using MI-BCI were advantaged compared to autonomous people when the companion was present. Encouraged by these first results we investigated the other potential benefits learning companions could bring to BCI training by improving the feedback, i.e., the information provided to the user, which is primordial to the learning process and yet have proven both theoretically and practically inadequate in BCI. From these considerations, some guidelines were drawn, open challenges identified and potential solutions were suggested to design and use learning companions for BCIs.